I get asked lots of questions about how I make my pictures so I thought I’d show you a glimpse of the process I go through. All my drawings start out as a pencil sketch. This often takes the longest as I draw a few versions, work out how I want things and usually get a lot wrong before I get it right. Next, I ink my work, for this one I used an Edding 1800 profipen 0.3. Once the ink is done I scan or photo the image and if necessary tidy up my ink work in Photoshop. Next I import the drawing into Adobe Illustrator and get to work on the lines and shading. I like shading first as it brings the drawing to life. Finally the colours is added. There are lots of tutorials on using Illustrator out there if you want to learn. Thanks! Very useful 🙂 love your drawings! WOW! I love your work and dream of being able to do it with mine.. But alas I am not so techie! AMAZING! 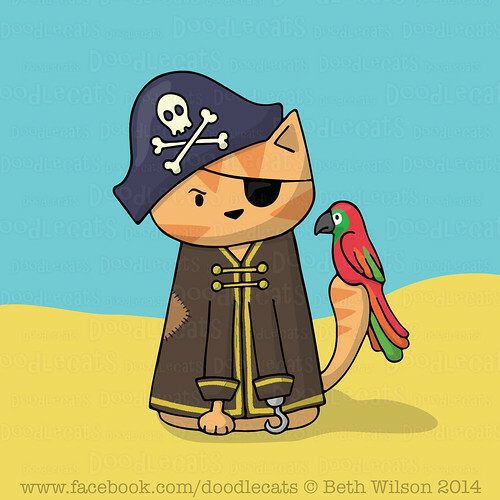 I love pirate cat by the way! 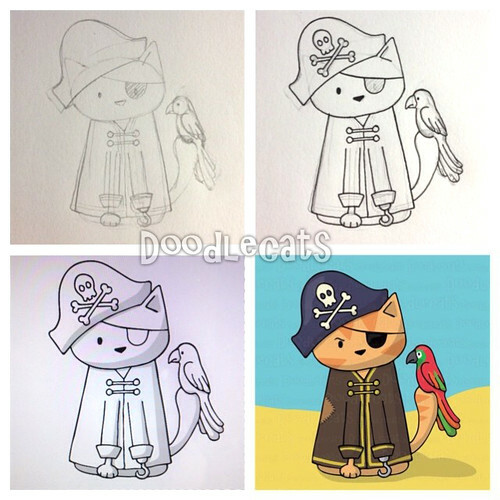 Love the pirate kitty! Thanks so much for telling us about your methods ‘n’ stuff!